Ichigo's zanpakutō is named Zangetsu (斬月 lit. cutting moon). 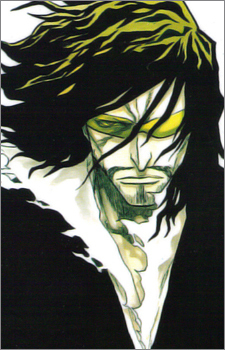 The spirit of Zangetsu resembles a 30 to 40 year-old man, and Ichigo calls him "old man" (おっさん ossan) as a result. Zangetsu has also been called the "black-clothed man" (黒衣の男 kokui no otoko). Zangetsu is portrayed as wise and calm in most matters, and fond of testing Ichigo in unusual ways, many of which have a purpose completely contrary to the stated goal. Zangetsu has displayed the ability to temporarily close fatal wounds during combat, though whether or not this is a unique ability is unclear. Unlike most zanpakuto, Zangetsu has no release command. The shikai form of Zangetsu resembles an over sized, though more elegant, cleaver blade without a hilt guard. The sword is as tall as Ichigo is, 1.74 meters, and has a black blade with a silver edge. When not in combat, the cloth extends to cover the rest of the sword and falls away when necessary, shrinking back to a manageable size. The cloth can also be used to swing the weapon like a flail and toss it at opponents, but this is rarely done. The bankai of Zangetsu, named Tensa Zangetsu (天鎖斬月, lit. heavenly chained cutting moon), is considered completely out of the ordinary for any zanpakutō. Unlike most bankai forms, which usually create some sort of massive creature or effect, Ichigo's bankai actually shrinks his sword down to a daitō (Japanese long sword) with a black blade, handguard in the shape of the manji (which is the kanji for "ban," meaning "full"). The cloth wrapped around the hilt is replaced by a short chain with a broken link, similar to that of a plus spirit. In addition to his sword, Ichigo's robe is replaced with a long-sleeved, ankle-length black coat with red lining that is closed at his chest, much like that of Zangetsu himself. When Ichigo enters the zanpakutō realm while it is in bankai, the spirit of Zangetsu seems much younger, around Ichigo's age. Zangetsu's special ability (in either form) is the getsuga tenshō (月牙天衝, lit. moon fang heaven stab, Viz: Moon-Fang Piercer of the Heavens), which fires concentrated energy blasts from the tip of the blade in the shape of a crescent moon. After revealing himself as the manifestation of Ichigo's Quincy powers, Zangetsu states that he originally did not wish for Ichigo to become a Shinigami, and did everything within his power to suppress his true potential. Believing that allowing Ichigo to become a Shinigami would mean risking life and limb, exposing to various perils, experiencing pain, and eventually would force Zangetsu to kill Ichigo. However, after having went through many trials, Zangetsu comes to term with Ichigo's perseverance and growth as a Shinigami, and starts to help him instead of hindering him, and eventually willingly relinquishes his hold on Ichigo. With the anime completed, fans are eagerly awaiting the announcement of the continuation of the series. That may be some time away with the manga still moving towards completion. This is the perfect opportunity to relive some of the hottest moments that really made Bleach memorable.